Merit Group & Associates: Big Middle-Income Complex in Queens?? Big Middle-Income Complex in Queens?? 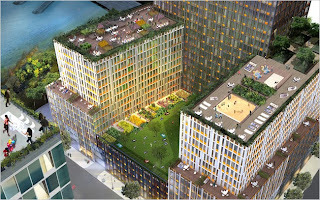 The Bloomberg administration announced Wednesday that it had selected a team led by the Related Companies to construct the first phase of a development on the Queens waterfront that will be the largest middle-income complex built in the city since the 1970s. A team led by the Related Companies was picked to construct two towers in the first phase of Hunters Point South, here in a rendering. Related and its partners — Phipps Houses, the largest nonprofit operator of affordable housing in the city, and Monadnock Construction, one of the largest builders of affordable housing — will erect two towers at what is called Hunters Point South, with 908 rental apartments, at least 685 of which will be set aside for working- and middle-class families earning $32,000 to $130,000 a year. Hunters Point South is a signature project of Mayor Michael R. Bloomberg’s housing and waterfront development policies. The entire 5,000-unit complex, which was first announced by the mayor more than four years ago, will offer subsidized housing for an unusually broad swath of working- and middle-class families. The city has invested heavily in the site, buying this once industrial stretch of waterfront, where Newtown Creek enters the East River, for $100 million. The city is also spending about $175 million on a toxic cleanup of the site, a 10-acre park, roads and water and sewer lines. It is also bestowing $50 million in grants to subsidize the affordable units in the first two buildings. A school is scheduled to open in 2013.